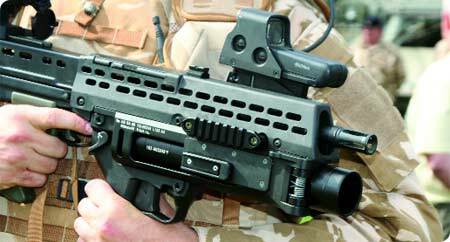 Soldier Modernisation | UK’s Future Soldier System gets defined? Home | Programmes | UK’s Future Soldier System gets defined? The procurement of the UK’s Future Integrated Soldier Technology (FIST) programme is well underway. In parallel, the UK is mapping out its future technology development path across the Dismounted Closes Combat (DCC) arena, in order to inform future procurement options for DCC. Currently in its second year of its assessment phase, the Future Dismounted Close Combat project is a research effort funded by the Defence Technology and Innovation Centre (DTIC), the organisation responsible for a lot of the research programmes in the UK. Stakeholders in the programme include; Director Equipment Capability (Ground Manoeuvre), the Dismounted Soldier Systems (DSS) Integrated Project Team (IPT), the Defence Clothing (DC) IPT, the Defence Science and Technology Laboratories (Dstl) and the Infantry Trials and Development Unit. A three year initiative that began in April 2007, the project is currently at the half way stage and FDCC will conclude in May 2010. The project takes its lead from LCG/1 in terms of domains. Arlow said, “The overall structure is focused on the NATO domains of Lethality, C4ISTAR, Survivability, mobility and sustainability”. Within the domains, individual firms in the consortium have the lead. For example within FDCC, Roke Manor Research responsible for C4ISTAR. In addition there a number of related research programmes. These include the DCC Survivability project being run by Dstl and ABSL’s Portable Power project. Clearly the infantry are central to FDCC’s content, but Arlow said, “We do actually need to consider the impact on other units and other roles that may need equipment.” He cited Engineers as one key battlefield user that is being borne in mind by FDCC. In regards to its long term work Arlow said, “We are looking at a range of Epochs, some of which cover existing programmes because we need to be aware of what those programmes are generating. We are also looking at the current time at beyond 2025. However our main focus is probably the 2015-2020 time frame.” The UK has arranged its thinking about future capabilities in a series of four Epochs: Current to 2015, 2015-20. 2020-2025 and from 2025 onwards. Arlow identified the broad goals of the project. FDCC will provide a Soldier Systems Roadmap, addressing the path of capability evolution, technology development and interaction with other programmes. Potential Quick Wins would be included in the overall technology database. Modelling and analysis capabilities would also be developed through a Soldier Systems Capability Model or CapTER and Operational Analysis capability. A final project output would also outline topics for future research. “A particular focus for us is the replacement of current small arms,” explained Arlow. Included in the work are requirements for bursting and fragmentation rounds including fuzing and guidance technologies as well as improved existing capabilities such as improved mountings, firing signatures and recoil mitigation. In the area of C4ISTAR Arlow said, “Fundamentally we are looking at what is the best way to get different types of information to flow around these levels.” While FDCC’s remit for C4ISTAR takes into account Bowman and FIST it will not directly support either programme. In terms of survivability, personal protection research is being led by the Dstl-led DCC Survivability programme. FDCC is looking both at reducing vulnerability to enemy fires by improved effects protection as well as reducing susceptibility to attack by research on reducing visible, near infra-red and other signatures. FDCC’s work on Sustainability addresses a portion of the NATO concept of this domain. It addresses technologies and application to reduce and regulate soldier temperatures, power generations and distribution and bio-medical monitoring. This is a comprehensive list of tasks but within its remit FDCC, deliberately does not address battlegroup logistics, hydration, nutrition, water harvesting and storage and other clothing related work. Andrew Arlow was speaking at NATO’s Future Soldier event. He has since moved positions.